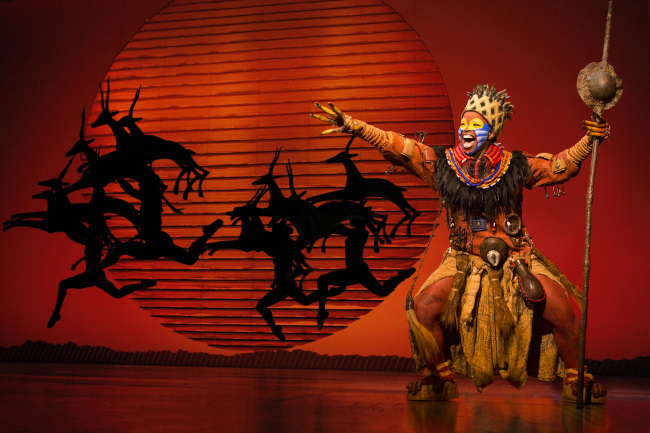 Truth be told, it feels almost irrelevant to discuss how great “The Lion King” musical is: What hasn’t been said about the multiple Tony Award-winning show that has been seen by over 95 million worldwide, across more than 100 cities in 20 countries? But seeing it onstage in its original language, for the first time in Korea, was a reminder that “The Lion King” is not just about the story, the music, the message, colorful -- in every definition of the word -- characters and creative set. It is all of those elements meshed together to create a truly unique experience that is quite unlike anything else. Experience is the point I’d like to emphasis about “The Lion King,” after seeing the show Friday in Daegu, the first leg of its Korea tour. The show kicked off with a creative re-imagination of the iconic opening scene, accompanied by the score “Circle of Life,” which immediately had me sold. Just like the 1994 Disney classic, the sequence was huge in every sense. As a child of the 1990s, “The Lion King” was one of the first movies I’d seen on the big screen, and I had extremely high expectations about the opening sequence that had mesmerized me as a wide-eyed child. To my surprise, it exceeded even my bloated expectations, as the legion of animals marched one by one onto the stage. The hymn of Africa was enchanting, as reverberating chants were joined by percussion that pumped up the atmosphere. Even the usually-reserved Korean audience burst into applause as the antelopes, giraffes, leopards and even the mighty elephant marched onward. Mukelisiwe Goba as Rafiki and the North American Tour Company. As a person who had never seen the musical, my concern was how serious the show could be if they were re-enacting the animals onstage. Yet, this was the part that made such a captivating experience. One could clearly see the people controlling the puppets, and some of the animals were clearly people but it did not provide any distraction. On the contrary, it helped deliver a genuine vibe of the African culture: Rafiki -- who was already a very human character in the movie despite being a baboon -- felt like a wise shaman, and Mufasa felt like the wise and powerful king that he is. This is because “The Lion King” is already a very human story, with a very human theme, as cast members pointed out in an interview prior to the show’s opening. The energetic movement of Simba and Nala -- whose masks barely covered their faces -- made them feel like tribal warriors rather than animals, which was fitting to the story. This is, after all, a story about loyalty, betrayal, friendship, love and coming-of-age. 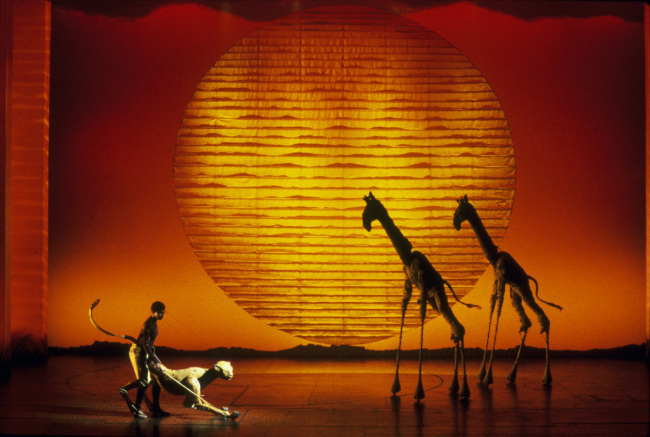 But when the show required, the props and costumes worked their magic to create Africa onstage. I particularly enjoyed the creativity in which props were used to create an image of a “certain character” -- to avoid spoilers for anyone who’s been living under a rock -- floating in the air. The designs of the masks themselves were beautiful and showed their character. Mufasa -- the original lion king -- had a face that was round and complete like the circle of life, but his son Simba had almost half a circle, indicating his immaturity. As for acting, Dashaun Young and Josslynn Hlenti as Simba and Nala brought out the energy and heart that lives within the characters. My nostalgic bone almost dreaded hearing the lines of Mufasa and Scar in voices other than James Earl Jones and Jeremy Irons, but Mthokozisi Emkay Khanyile’s strong voice and onstage action were more than enough to portray Mufasa’s strength, both physical and spiritual. Antony Lawrence was enjoyably slimy and menacing as Scar, not only with his sneering voice but also with each tiny movement. This guy, just as you’d expect, is one cat you’d love to hate. As for Zazu, Timon and Pumba, they were simply Zazu, Timon and Pumba of the old, the funny, loveable dunces that had me floating around in nostalgic heaven. And oh, the music. “The Lion King” animation has always had a perfect mixture of contemporary pop and tribal sound, and I daresay the musical steps it up a notch with its live performances and the chorus of enormous ensemble. “The Lion King” plays at Keimyung Arts Center in Daegu until Dec. 25, after which it will move to the Seoul Art Center for performances from Jan. 10 to March 28 next year. The show will continue in Busan at Dream Theater the following month. The musical runs for 150 minutes and is available to those 8 years old and above. Tickets range from 60,000 won ($53) to 170,000 won. After wrapping up in Korea, The Lion King International Tour will move to Taiwan.